<input type="email" name="email" id="email" data-validation-engine="validate[required,custom[email]]"
data-errormessage-custom-error="Let me give you a hint: someone@nowhere.com"
Options are typically passed to the init or attach action as a parameter. Name of the event triggering field validation, defaults to blur. Determines if we should scroll the page to the first error, defaults to true. If set to false, it removes blur events and only validates on submit. Where should the prompt show? 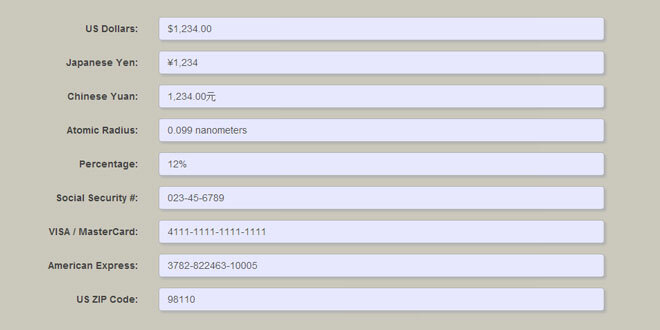 Possible values are "topLeft", "topRight", "bottomLeft", "centerRight", "bottomRight". Defaults to "topRight". Default position adjustment could also be provided. Only display the first incorrect validation message instead of normally stacking it. 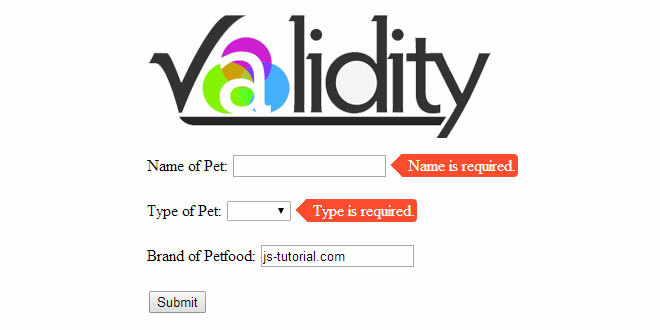 It will follows the validation hierarchy you used in the input and only show the first error. If set to true, turns Ajax form validation logic on. Defaults to false. 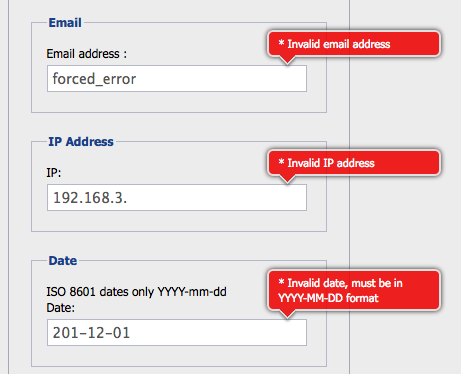 Form validation takes place when the validate() action is called or when the form is submitted. When ajaxFormValidation is turned on, this function is used to asynchronously process the result of the validation. the status is a boolean. If true, the ajax call completed and all the server side form validations passed. When defined, it stops by default the form from auto-submitting, and lets you handle the validation status via a function. You can also return true in this function and the form will be allowed to submit. This is where custom messages for IDs, Classes, or validation types are stored. Custom error messages areexclusive from one another.ID messages will be displayed instead of anything else; Class messages will only be used if there is no ID message, and only the first message found associated with one of the classes will be used; Global Validator messages will only be used if there are no Class messages or ID messages. it has other custom messages." inputs without an ID message." 'required'. This only displays when there are no Class or ID messages." If set, this callback function will be called when all validations passed. If set, this callback function will be called when it found an error. Determines if the prompt should hide itself automatically after a set period. Defaults to false. Sets the number of ms that the prompt should appear for if autoHidePrompt is set to true. Defaults to 10000. 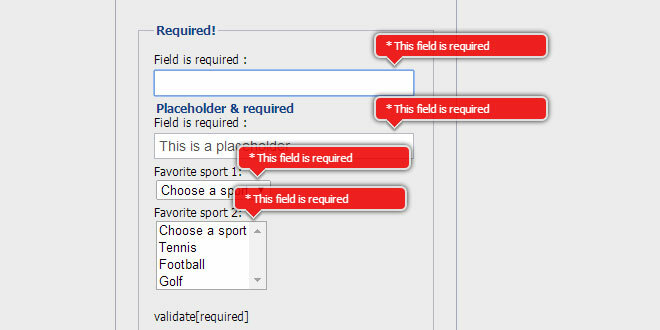 Validates a form or field, displays error prompts accordingly. Returns true if the form validates, false if it contains errors. It is inversed for fields, it return false on validate and true on errors. When using form validation with ajax, it returns undefined , the result is delivered asynchronously via functionoptions.onAjaxFormComplete. Displays a prompt on a given element. Note that the prompt can be displayed on any element by providing an id. 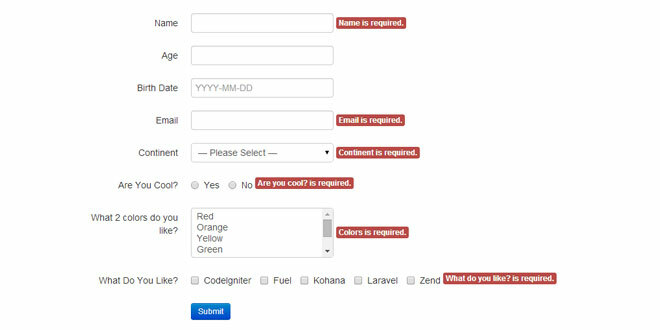 The hide method can be applied to a form or a field. Closes/hides all error prompts on the page no matter what form they are attached to. Update the form prompts positions.